I added a bar code to my blog with the URL embedded in it. For those of you living in medieval times and don't know about this, tech savvy individuals (aka nerds) have phone applications that let them aim their phone camera at these bar codes and effortlessly save the information. I would put this on my business card if I ever saw any live people. 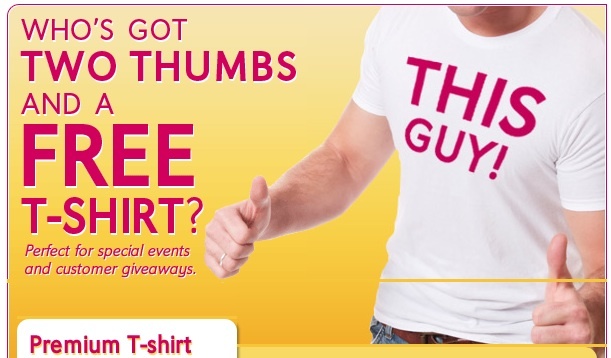 This morning I got a high-larious email reminding me I can get another free t-shirt from Vistaprint, and half off image uploads. Maybe I'll create myself a large version of the bar code and have it put on a shirt. Nerd cred through the roof. I can't stop laughing at this graphic. This is the one the designer made on his last day on the job. He was hungover and just didn't care. Everybody has one really bad idea that makes it out in public and they are ashamed of it forever. You can tell he knew it and he didn't even try to make the lettering not look pasted on Stock Photo Man's chest. This is your bottom, Mr. Vistaprint Email Designer. It's all better ideas from here on out, fella. Good luck to you!